Congratulations on winning the C Consolation Final. 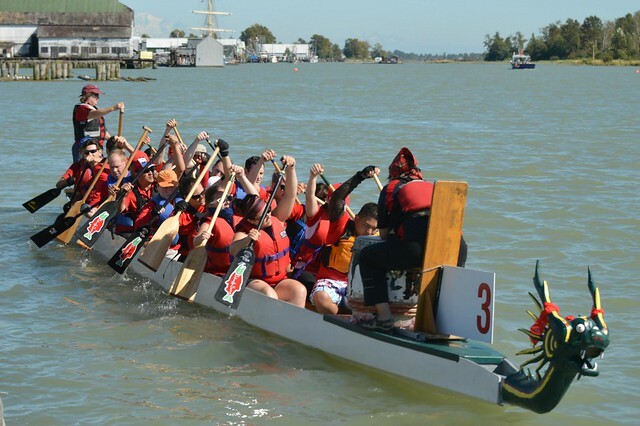 The most decisive 1st place finish in our season this year… and in a final too! Good fun times, and great people on the team. Everybody pitched in and also brought friends to cheer us on! Karl reported that our 3rd race was the fastest race time of the season! Congratulations – we kept it controlled and steady. 4th race – no debriefing – we won by a boat length – end of story and a fabulous day of racing…. But wait…. we won a little Chinese drum for 1st place in Consolation C. Several of us had stayed for the medal ceremonies: Deb, Todd, Anne-Cecile, Anne D, Robyn, Diana and Nicolas all stood on the ceremonies stage with our drum !!! soon – canoe paddle on Burnaby Lake for beaver spotting!!! 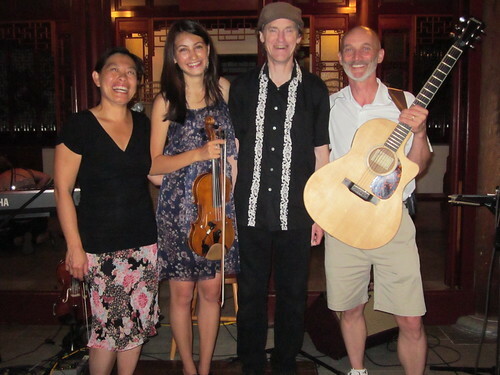 The Doctor Sun Yat-Sen Gardens’ Enchanted Evenings series lived up to it’s name Friday night with the inclusion of the Jocelyn Pettit Band – a toe-tapping Celtic Band that features a 17 year old Chinese-Celtic-French-Canadian fiddling wonder! There really can be no more magical a setting than the interior courtyard where the audience was surrounded by rare trees and traditional stone work around the fish pond. This did not go unnoticed by the band members who obviously enjoyed themselves as much as the full house. At sunset the crows threatened their evening murder as they always do, but even this could not transpire against the spell cast on the gardens that night. In our defence, fairies zipped round our heads protecting us form mosquitoes. They might have been dragon flies though. The band comprises family friend Bob Collins on guitar and vocals as well as the Pettit family, with father Joel Pettit on bodhran, mother Seiw Wan Khoo on keyboards and second fiddle, all to support Jocelyn on fiddle, tap shoes and vocals. How she managed to stay perched on her chair tapping her toes in the French Canadian style is a mystery to me. She also performed traditional Irish step dancing on some songs while fiddling as well. Even more astonishing is how a seventeen year old can command such skill and nuance on a violin. Whether bowing a lively waltz or drawing out a slow air in her pan-Celtic repertoire Jocelyn has an attack on the bow and fingerboard which belies her young years. Jocelyn easily displayed her craftsmanship and maturity on her more recent songs Late for the Feast and the as yet unnamed waltz which she debuted for us. It’s uncanny how much expression her fiddle playing displays. Jocelyn also sang on a few songs. She has excellent pitch and expression, but lacks the support and resonance of a professional singer. Luckily she still has time to improve her skill with this instrument and I sincerely hope she does because next to her charming step dancing and wonderful fiddle playing it tends to stand out in the few songs where it’s employed. She chatted to the audience and built up an informal camaraderie that was charming in its own right. It was an indeed an “enchanted evening” as Jocelyn cast a spell of her own with her evident joy and charming smile. She smiled and fiddled and danced the whole night away to joy and swept us all away with her. I couldn’t stop grinning myself. For an encore the band evoked the spirit of Oberon himself playing King of the Fairies to bless us all to a good night – and it was. I can highly recommend this captivating fiddler and her family and friend to put a smile on your face, and a tap on your toe. You won’t regret it. The Jocelyn Pettit Band performed at the 2011 Gung Haggis Fat Choy Robbie Burns Chinese New Year Dinner, which led to Jocelyn’s inclusion in the inaugural 2011 Hapa-Palooza Festival. Jocelyn says her ancestral heritage includes Chinese, Irish, French and Scots – but she is definitely 100% Canadian. Larry Kwong, pioneer hockey legend is coming to Vancouver! Come meet HISTORY – Larry Kwong – the first person of colour to play in the NHL. Less than a year after Jackie Robinson shattered the baseball color line, Larry Kwong broke the barrier in hockey. On March 13, 1948, Kwong made his NHL debut with the New York Rangers against the Montreal Canadiens in the Montreal Forum.